It’s just not the holidays until my dear wife decides it’s time to make the caramels. Not just any caramels – the caramels that we’ve been making together for the twenty-some-odd years we’ve known each other. She was making these “before me” and invited me to help pour and wrap. The next year it was our little project. First we made single batches of them in a guaranteed-to-scorch Visionware pot on the crappy stove in her little tree-house apartment and passed them out to friends and family. Then I brought my 12-quart Griswold No.10 Dutch oven to the party and we started making double batches so that we both had enough to take into our offices too. 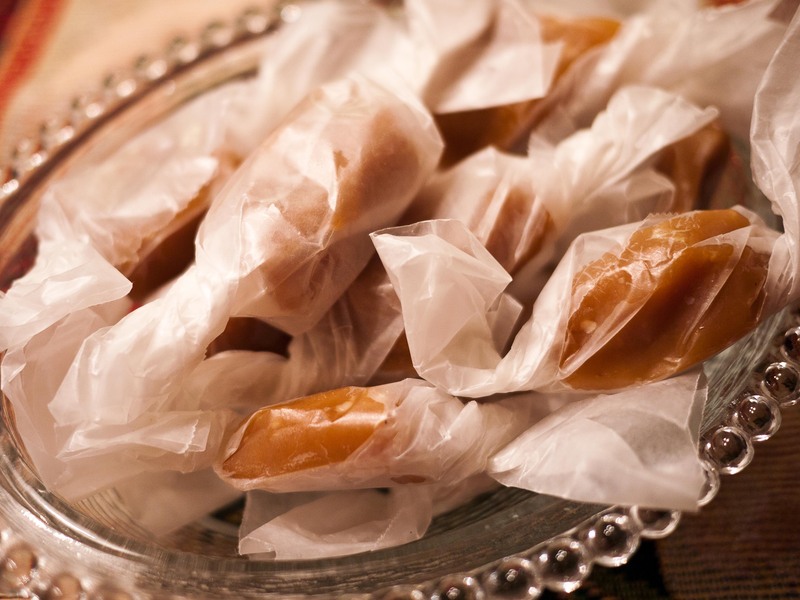 By the time we’d bought our first house we were getting so many requests for the caramels that we were making two double batches and shipping a good portion of them out of state. This year we’ve trying to eat better, so we’re back down to a just a double batch. My dear wife whips them together in the same old Dutch oven (cast iron does magical things to caramels), eschewing a candy thermometer for the old-fashioned “dribble some in a cup of water” test to see if they’re ready yet. We still debate whether my “ready” is the same as her “ready.” But by the time she’s won the argument the caramels have cooked for another five minutes and are at the perfect stage. Then there’s the mad rush to stir in the nuts (hand-cracked and picked over Iowa black walnuts, a labor of love from my dad) and vanilla extract (with much hissing and bubbling) and then get the molten mass poured into a sheet pan. I pour, she scrapes, we both try to not to burn each other. 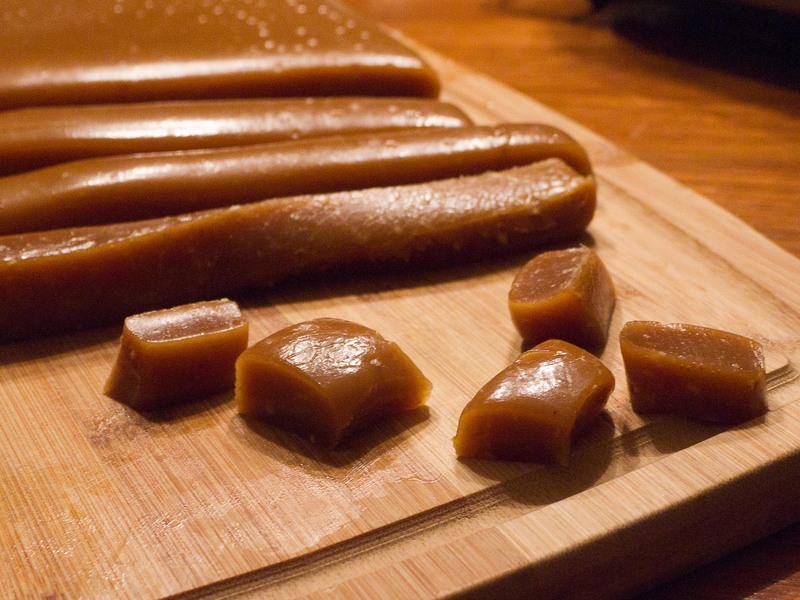 We’ve been doing this long enough to learn the hard way that how and where you cool the caramels is very important. If you put them out in the cold to speed it up the outside gets rock hard while the inside is still too soft and if you just let them sit in the warm kitchen it’ll be midnight before you can slice them up. So now they get poured into a wide and shallow antique aluminum pan from my dear wife’s Grandmother and then moved to a cooling rack set in a cat-proof area with the window cracked open just a little bit. About 2 to 3 hours and they’re just firm enough to cut. Now the production line starts up. My dear wife has already cut the wax paper wrappers to size. I then need to gently coerce the slab of caramel out of the pan. If we’ve greased the pan well enough, sometimes the best way is to just flip the pan over onto a cutting board and walk away for ten minutes while it takes care of itself. If not, I find that loosening the edges with a spatula usually does the trick. The best tool, hands down, for slicing up caramels is a pizza cutter. Not the rolling kind, but the long bladed one that you can rock back and forth. I sharpen the heck out of one of these and then first cut the slab into 1/2-inch wide strips. Each strip then gets cut into 3/4 (dear wife size) or 1-inch (Dave size) chunks. If the blade gets too sticky, I just wipe it off with a warm, wet dish towel. I cut, she wraps, the cats watch, Jimmy Buffett’s Christmas Island plays on the stereo. In less than an hour we’ll fill half a grocery bag with chewy delights. Combine sugar, syrup, butter, and cream in a heavy four quart pan (cast iron, if available). Cook on medium high heat until mixture reaches a rolling boil, then turn heat down to medium low and stir often with a wooden spoon. 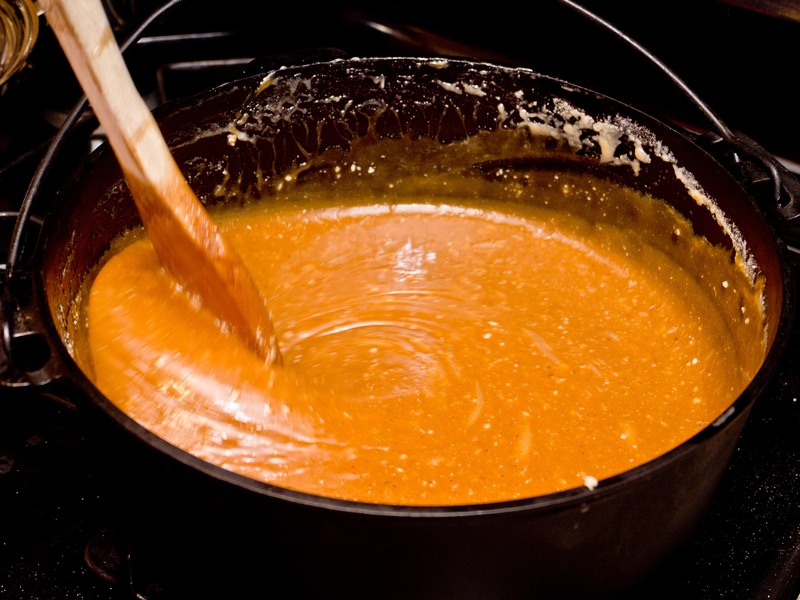 Keep mixture at a rolling boil until candy thermometer reaches hard ball stage or 265°F. Remove from heat. Add vanilla and walnuts. Stir to combine, then pour into a buttered 11 x 7 pan. Let set for three hours or until easy to cut. Run knife around edge and turn onto cutting board. Cut into bite sized pieces and wrap in waxed paper. Caramels are hands down my favorite candy. I really should learn how to make them. Candy making is such an art. And the cooking process with that incredibly heat intensive cauldron of sugar can be somewhat intimidating. Great tips and thanks for sharing your secrets. I love traditions like this. Wow. Looks awesome! I can see that it would take some trial and error before you get it down pat.